Sydney Water was keen to explore innovative, high quality and cost effective solutions when they replaced the roof of the Campbelltown Reservoir. Sydney Water provides high quality water to around five million customers. So naturally they are keenly focused on providing their customers with better value for money and a high quality service. The original “pie shaped” designed roof had corroded. Internal structural steel supports required extensive maintenance. Spantech worked with Engineers SASTTI to deliver an innovative design using the Spantech 370 Series panel. Spantech used the 370 Series panels’ straight profile for the project. Panels were rolled in continuous lengths, then lifted to the roof in packs and sprung curved as they were laid over the structural supports. 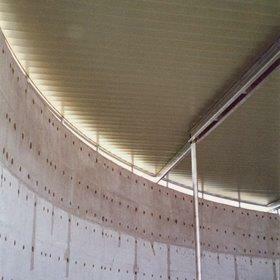 To achieve the rounded shape, panels were simply trimmed to follow the existing line of the reservoir. This solution dramatically reduced the amount of internal structural supports, saving construction time and construction costs. It also significantly improved the ventilation in the reservoir. Spantech also helped reduce ongoing maintenance costs by rolling the panels from aluminium. This will extend the effective life of the new Campbelltown Reservoir roof from the 50 years required by Sydney Water, to around 80 years. Spantech is currently developing a number of new products that are ideal for water reservoirs. Spantech and SASTTI are planning to use these new products in the suite of new projects in development for Sydney Water. Spantech’s innovative approach to roofing will benefit Sydney Water and their customers now and well into the future.